Who’s ready for some summer fun? Lucy’s Crab Shack is finally here, and we’ve been dying to tell you about our next Little P, On the Boardwalk. 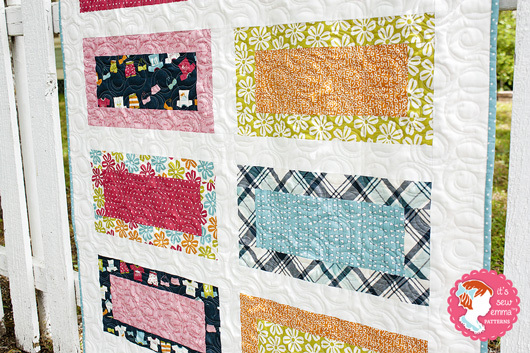 I actually dreamed up this quilt one night, believe it or not! As soon as I woke up, I got to work, and out came On the Boardwalk. If On the Boardwalk were a person, specifically our sample in Lucy’s Crab Shack, I imagine he’d be a free spirited beach bum with a collection of bikes and surfboards who has sand in his toes more often than not! Of course this pattern allows you to add whatever personality you’d like with its big blocks just begging for fun novelty prints! 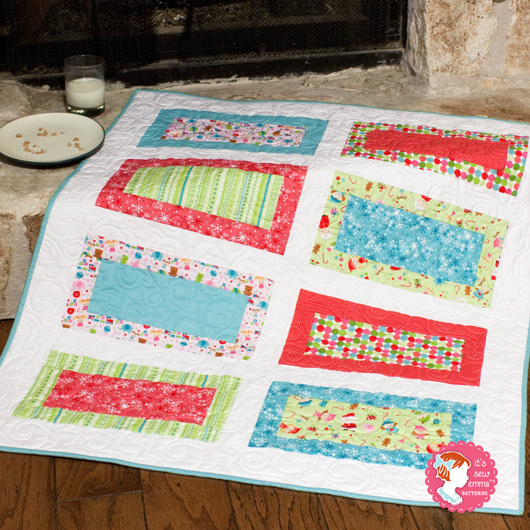 A super easy quilt that you can finish in just a few hours, you’ll be whipping them out right and left, for everyone you know! Right before Market, we were able to whip out a few more, like our Secret Santa..
And like all of our Little P’s, all you need are a few fat quarters, background, binding and backing. Shop owners, you can find this pattern as ISE-502 at United Notions, Checker Distributors, Brewer and EE Schenck!